In this selection from the two-volume Plain Speaker, Tom Paulin and Duncan Wu have given priority to essays that address some of the most important critical issues both in romantic studies today and the poetics of prose. 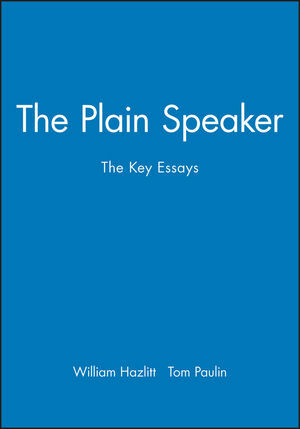 Provides the only edition of The Plain Speaker available outside libraries since 1928. Contains Hazlitt's seminal essays on plain speaking and the major romantic topics. Includes a brilliant introduction by Tom Paulin, the greatest poet-critic of his generation and the editorial expertise of Duncan Wu. Duncan Wu is Reader in English Literature at the University of Glasgow. He is the editor of Romanticism: An Anthology, Women Romantic Poets: An Anthology, Romanticism: A Critical reader, A Companion to Romanticism, and Wordsworth's Five-Book Prelude, all published by Blackwell. He also edits the Charles Lamb Bulletin, and is currently preparing a 9-volume edition of Hazlitt's selected works for publication in 1998. Tom Paulin is G.M. Young Lecturer in English Literature at Hertford College, Oxford University. His major study of William Hazlitt, The Day-Star of Liberty: William Hazlitt's Radical Style, was published in 1998 by Faber and Faber, publishers of his several volumes of poetry, including Selected Poems 1972-1990, and of the critical collections Minotaur: Poetry and the Nation State (1992) and Writing to the Moment: Selected Critical Essays 1980-1996. 1. The Plain Speaker. .
2. On the Prose-Style of Poets. 3. On the Conversation of Authors. 4. The Same Subject Continued. 5. On Reason and Imagination. 6. On Application to Study. 7. On the Old Age of Artists. 8. On Envy (A Dialogue). 9. Whether Genius in Conscious of its Powers?. 10. On the Pleasure of Hating. 13. On the Difference Between Writing and Speaking. 14. On a Portrait of an English Lady, by Vandyke. 15. Madame Pasta and Mademoiselle Mars. Appendix I: Advertisement to Hazlitt's Table Talk (Paris, 1825). Appendix II: 'A Half-length': an uncollected Hazlitt portrait. Appendix III: Reynolds' account of Hazlitt, 28 April 1817.